Join The Travel Tester in search for great hotspots around the world. 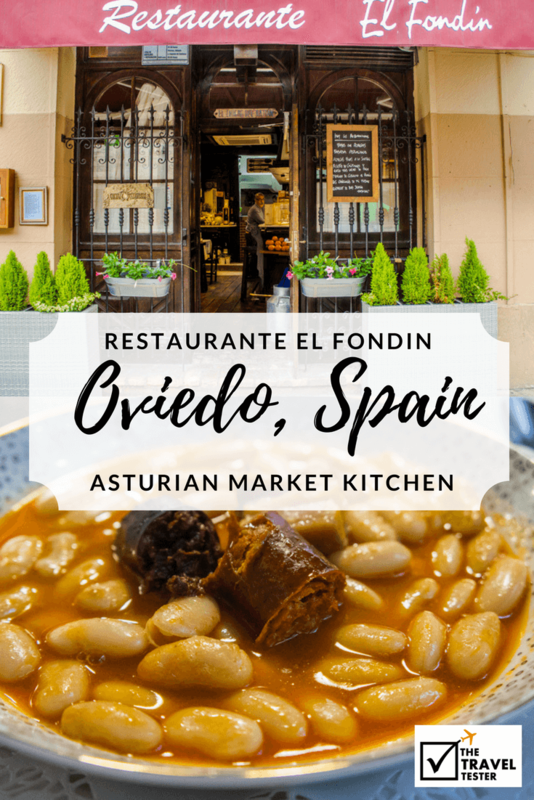 This week, we'll visit Restaurant El Fondin in Oviedo! When you come to Oviedo in the North of Spain, you better arrive hungry. There is so much good food around here, you wished you booked a month here as soon as you’ve arrived, trust me! During my short visit, I wanted to taste as many local dishes as physically possible, but during lunch my eye was definitely bigger than my stomach, because boy, did I struggle!! Well, to be fair, my Spanish tour guide also had a hard time with the food at this place… not because it wasn’t great (it WAS), but because the portion size was just incredibly big! We already ordered half-sized plates, but still! The restaurant is located in a small alley right off Plaza del Fontán (the square where the UNESCO World Heritage Fountain can be found) and the area is noisy with tourists. There is definitely someone with interior design skills working at this restaurant, because there was such a nice combination of old and modern furniture! I especially LOVED the plates, which were all different. How cool are the plates?! We’re getting handed with menu’s, but as my tourguide obviously speaks Spanish (and wants me to try as many local dishes as humanly possible), she asks the waiter to give us a selection of some dishes. The waiter also spoke English, so you’ll be fine just asking him for a recommendation! I realized when served the pathe is foie gras (duck/goose liver), which I am not comfortable eating as you’re never sure the animals have been force-fed or naturally fed, so I politely gave my portion to my guide. I did enjoy the torte with apple though! It felt like I was exploding after all that food… not kidding! With the open kitchen, there are some amazing smells coming your way in the dining area! The food is incredible here. This place seemed to be quite popular for lunch (people came in around 3ish, so if you’re early, you’ll probably be in an empty restaurant), so you might want to make a reservation. This charming restaurant definitely deserves a visitor with a bigger appetite than I had when I sat down for lunch, because the meals are just too good not to finish. If you’re looking for typical dishes from the Asturias region of Spain (with ingredients coming from the fresh market right next door) and a nice, relaxing place for lunch, then this is the place you want to get a spot at! You can find El Fondin on Facebook and Twitter. Disclaimer: I visited this restaurant as part of the #SpainCities blogger campaign. All opinions and photos are, as always 100% my own. Previous articleArt in Oviedo Spain: Hundreds of Sculptures Waiting to be Discovered!